Teenager Tyler Adams scored his first international goal as a new-look United States side defeated 10-man Mexico 1-0 in a friendly international on Tuesday. New York Red Bulls midfielder Adams burst into the penalty area to tuck away an Antonee Robinson cross on 71 minutes to settle a hardfought encounter at Nissan Stadium in Nashville. US interim coach Dave Sarachan praised the 19-year-old Adams' performance. "This kid's a beast," Sarachan said. "When you look at data, analytics and the volume of work he does in 90 minutes, he's a winner, this kid. "He keeps getting better. Not perfect but he's shown that he's emerging as someone that other players can look up to." Adams' goal came after tempers had flared during the second half of the latest meeting between the two bitter North American football rivals. 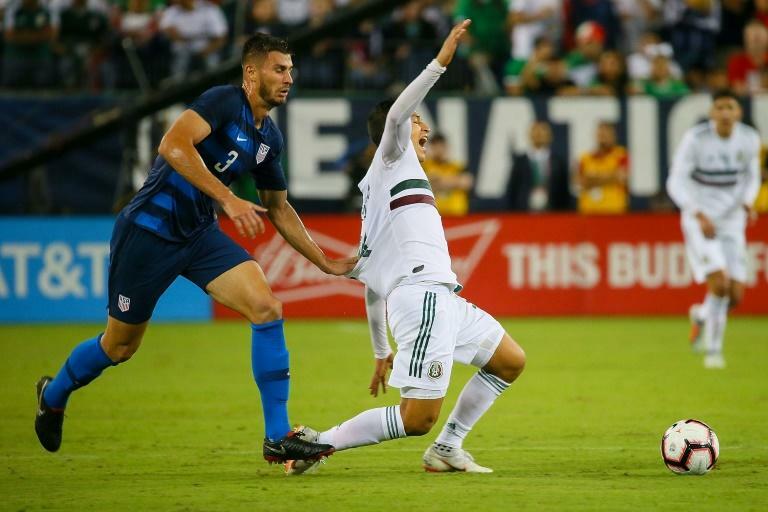 Mexico's Angel Zaldivar had been shown a red card in the 66th minute for a brutal challenge on Wil Trapp that saw the USA midfielder lucky to escape serious injury. "We knew that at some point in the game it might boil over," Sarachan said. "And I do think our guys showed great composure." The complexion of the game changed when Sarachan replaced Eric Lichaj with the left-footed Robinson, who plays for Wigan in the English Championship, early in the second half.